Fully CNC machined with polished housing. 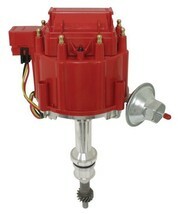 Adjustable vacuum advance canister to improve economy. Premium caps with brass terminals. High output coil which produces 48,000 volt spark through 7,000 RPM. True spark alignment for instantaneous response at high RPM.